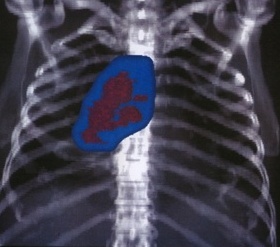 3D Conformal Radiation Therapy (3-D CRT) is a technique where beams of radiation used in treatment are shaped to match the tumor. Modern image modalities including computed tomography (CT) and magnetic resonance imaging (MRI), provide a virtual 3D model of the patient’s anatomy. This allows radiation oncologists to identify more accurately tumor volumes and their relationship with other critical normal organs. The information from the virtual model is then used to plan your radiation treatments. Multiple beams are constructed and the most favorable beam angles are selected. The beams are then applied to the virtual model of the patient. 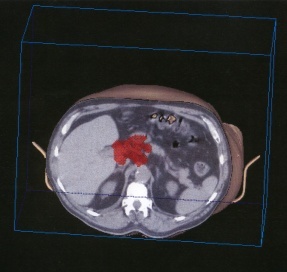 Using this technology, we are able to view the tumor in three dimensions and sculpt the radiation beams to the shape of the tumor limiting radiation exposure to surrounding healthy tissue. Three-dimensional conformal therapy is, in many ways, similar to IMRT- intensity modulated radiation therapy. Both are used to target the tumor while sparing surrounding healthy tissue.